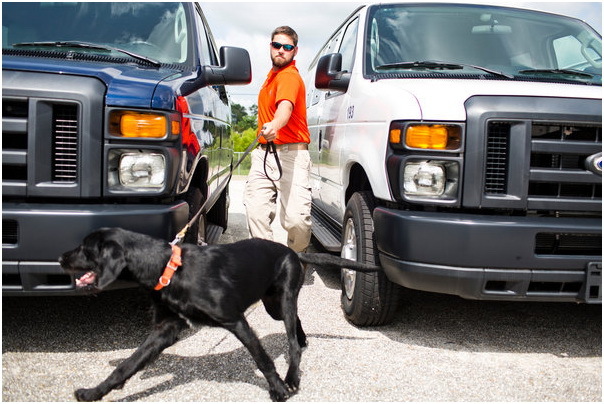 Bart Rogers, a canine instructor with the Canine Performance Sciences Program at Auburn University, working with Notty, a 10-month-old puppy searching for a hidden target. Opelika and Lily, yellow Labrador retrievers, are part of the Canine Performance Sciences Program at Auburn University, which breeds and trains dogs to use their powerful sense of smell to keep people safe. After a year of preparation, Opelika will probably be placed with a government agency or a private security firm to sniff out bombs, narcotics or other threats. For about half of that year, she will live in a state prison, where inmates who have earned the right to work with the program’s dogs lavish time and attention on them to hone their detection skills and reinforce basic socialization. It’s a lot for a 6-week-old puppy like Opelika to take on; most dogs spend their early months learning little more than how not to gnaw on the living room furniture. But program organizers say the regimen produces highly disciplined dogs whose abilities rival or surpass cutting-edge technology. 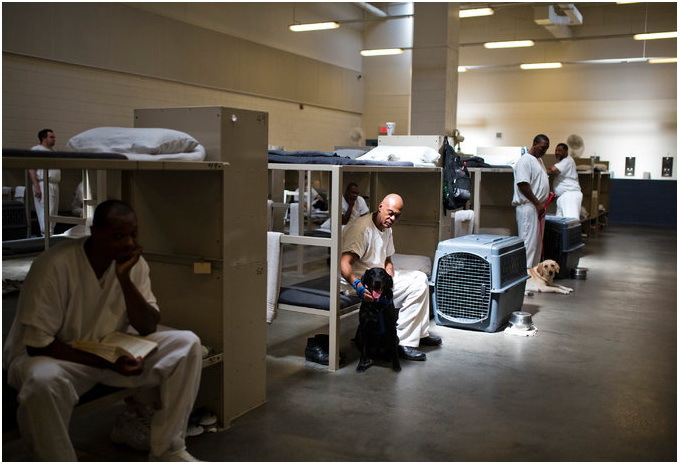 The dogs, mostly Labradors — a breed chosen for its sociability and physical resilience — emerge from the prisons “more mature mentally,” said a chief instructor at Auburn. 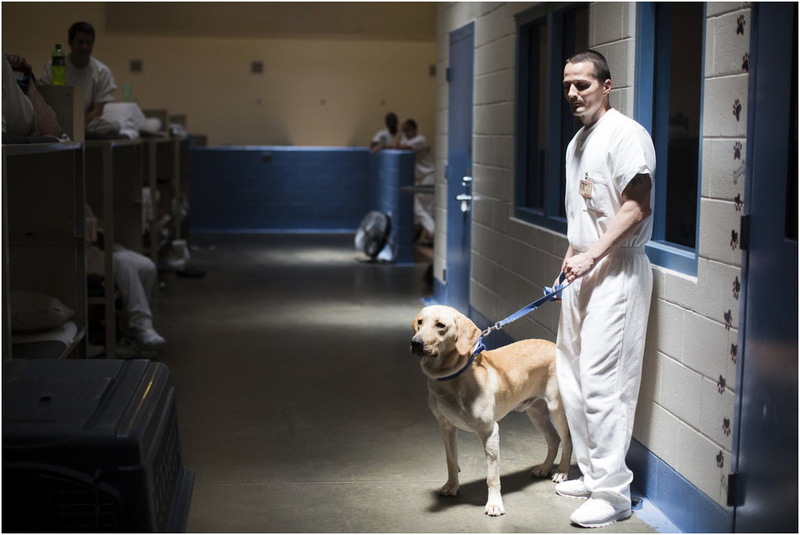 “They have more stamina and endurance.” And along the way, moments of startling humanity come to light: One older inmate cried when he met his puppy. “I haven’t touched a dog in 40 years,” he said. For many years, dogs here were trained to find improvised explosive devices — homemade bombs — that had been planted in a parked car or stashed in a village bazaar. That focus changed somewhat about eight years ago, when Auburn’s scientists and trainers were approached with a new challenge: how to detect an I.E.D. that is on the move, carried by a would-be bomber. What was the most effective way for dogs to patrol crowded areas? If that sounds fairly straightforward, “it’s a bigger challenge than you think. Dogs naturally want to interrogate things and people, and not open space. Among the first animals trained under the new protocol were dogs deployed by Amtrak in 2007, and the rail service has used more than 70. Dogs schooled in vapor wake detection have also guarded the New York City subway system, presidential inaugurations, and sporting events at Busch Stadium in St. Louis. Buoyed by the dogs’ advances in tracking air currents, the Canine Performance Sciences Program, began experimenting with even more elusive targets, including pathogens. In a video shown to a visitor, a dog named Baxter sniffs at the cabinets in a vacant house used as a research site, alerting when he finds a swab of a nasty cattle virus. Researchers are interested in, among other things, whether dogs can be used to find viruses that affect livestock, in the hope that ranchers would no longer need to destroy entire herds to eliminate a few infected animals. No one knows precisely what makes a dog’s sense of smell so sensitive, but many say olfaction may be “the most ‘preserved’ sense — it’s probably the most ancient one.” Dogs’ eyes and ears remain closed for about 14 days after birth, but “pups come out smelling, that’s how they interact and get around the world.” By most estimates, dogs have 40 times as many olfactory receptors as humans do — 220 million versus five million. Studies using rats, another animal with superior smelling abilities, have indicated that even when 95 to 98 percent of the receptors are degraded, a sharp sense of smell remains intact. Floyd, a black lab, working in an olfactory detection study. Since their program’s inception, Auburn’s trainers have known that the dogs must be continually rewarded, primarily through toys and verbal encouragement, when they have given an alert they have found a target odor. Until recently, however, the scientists could only speculate on the brain activity behind the dogs’ extreme drive. 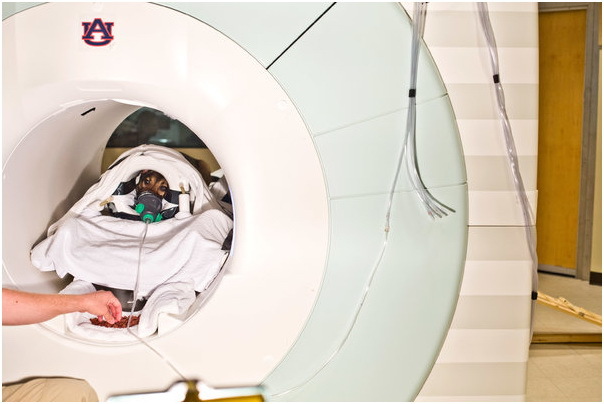 A Belgian Malinois that has been trained to lie motionless while fully awake and unrestrained, is presented odor stimuli while undergoing a functional brain M.R.I. 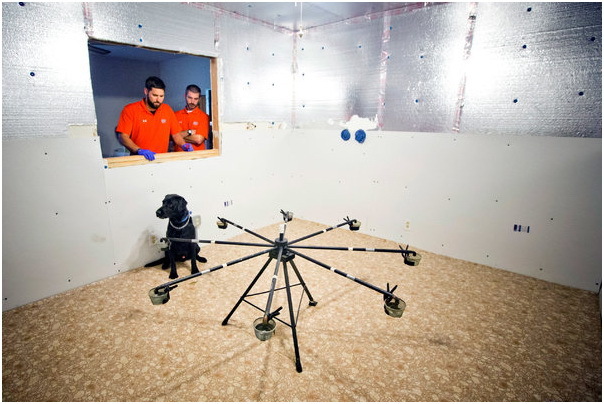 The study is investigating the cognitive processing of odor information by dogs to better understand how to select, train, and employ dogs for detection tasks. They are also focusing on the default mode network. The more integrated the network is with the rest of the brain, the higher the likelihood of “referential thinking,” a foundation necessary for sophisticated emotional states, like empathy. Though the research is in its early stages, Dr. Waggoner said it could have implications for identifying which dogs will succeed in detection roles and which will thrive as assistance animals. On a day cold by Alabama standards, a black lab named Gus ignored the biting wind and sprinted through a pavilion in a grassy clearing at a training site to scrutinize half a dozen wooden boxes, each with a hole in the top. One of the boxes hid a powder that mimics explosive chemicals, and when Gus alerted on it, he was given a toy. Gus and his sister Gala had returned to Auburn days earlier, after six months with their prison handlers. While Gus had immediately stood out, Gala was tentative, “a little more squirrelly,” said Terry Fischer, a chief instructor. As she hunted targets in the brush and gamy husks of felled trees, she looked to her trainer Bart Rogers for help. “Coyote or whatever else she’s smelling out here, it just shut her down,” he said. In the next few weeks, Mr. Fischer and Mr. Rogers would work with the dogs on increasingly challenging tasks, adding to the number of boxes and then moving on to vehicles and complex settings like warehouses and power plants. “It’s about getting to what people call ‘left of boom,’ ” he added. Among people who work with dogs, it is widely understood that the first year of an animal’s life is vital for imprinting. That is when it learns how to socialize and grows accustomed to the sights and sounds of its environment. For the Auburn dogs, this is when they must grasp the kind of trusting but strict relationship they will have with their eventual handlers. About 80 percent would fail to meet the rigorous detector-dog standards: “They had been raised as pets,” said Ms. Brock, the Auburn instructor. “The main problem was lack of structure.” (Dogs that drop out are offered for adoption or retained for noninvasive research.) Knowing that service animals had been successfully trained in prisons, the program leaders decided in 2004 to place dogs at Bay Correctional Facility, in Florida. The failure rate fell quickly with the shift to a more stringent environment, and now Auburn has partnerships with five prisons in Florida and Georgia. in the work of Gary Settles, a mechanical engineering professor at Penn State whose research had shown that humans produce thermal plumes that emanate from our bodies and entrain gaseous particles. Most of these particles, like traces of perspiration or perfume, are benign, but the plume can also betray contact with hazardous materials, like those used in bombs. Instead of screening each person, then, the dogs could inspect the “human aerodynamic wakes” that trail behind people in motion and alert a handler to the presence of explosives..
James Reeves, the co-manager of the prison’s dog program, retrieved a black Lab named Keisha from the dog dormitory. She bounded in, and though she looked alarmed by her audience, she quickly found the target odor. In response, the inmates whooped and hollered and clapped, and one of them tossed her a red ball. Some of the Coffee trainers are old pros — one was working with his 10th dog — while others are new to the program. They live in a dedicated dorm, where the dogs’ crates nestle against the inmates’ bunks. Not every inmate is eligible. To apply, inmates must have a high school diploma or its equivalent and be free of disciplinary reports for a year — a considerable challenge, Mr. Perry said. Working with the dogs, he said, speeds that process. “A lot of these guys have never been given a lot of responsibility, and this is their chance not only to be a responsible adult but a responsible citizen,” he said. Striding past it, Warden Perry and Ms. Brock, the Auburn instructor, paused at the end of a row of bunks, an empty crate brushing their knees. The inmate gestured at the metal grate, onto which he had taped a photograph of a Lab. It was not Joel but a look-alike from a magazine. Possessions are few here, some flimsy, all of them essential. As was this one, a reminder of a dog trained to protect, who may have already done some of his most wondrous work. Previous Previous post: How Can You Abandon Your Pet?